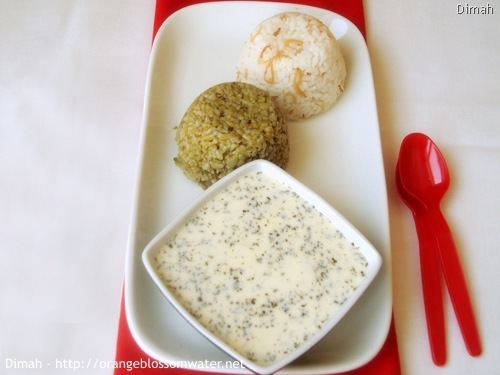 Shakriyeh is yogurt cooked with lamb meat, served with frikeh (roasted green wheat) and rice. 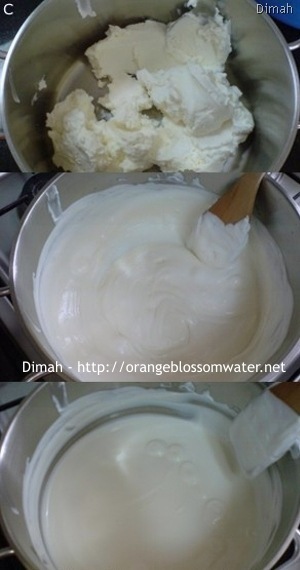 Before talking about the method of cooking Shakriyeh, I’ll tell you some information about the yogurt itself. In Syria, we have special yogurt we name it “Laban Arabi” which is made from sheep milk, and we have “Laban Baqari” which is made from cow milk. 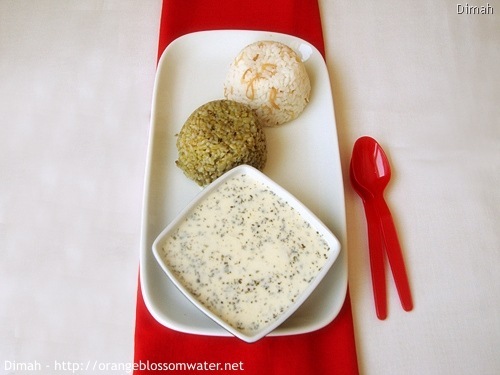 In cooking, we use only “Laban Arabi” which is from sheep milk. If you want to cook yogurt sauce, and you have yogurt made from cow milk so this yogurt is not from sheep milk i,e not “Laban Arabi”, Please see what will happen during cooking ! Look at these pictures (A, B and C) and read carefully. A. This yogurt is not “Laban Arabi”, when you add it to the pot and turn on heat, and stir it, it curdles and this is not good for making the yogurt sauce. B. This is the same yogurt I used in “A”, but here combine yogurt + cornflour (cornstarch), then turn on heat and stir, so it doesn’t curdle, and that’s what we want for cooking. C. This is “Laban Arabi”, In the pot there is only “Laban Arabi”. Turn on heat and stir, the result that it doesn’t curdle and that’s what we want for cooking. 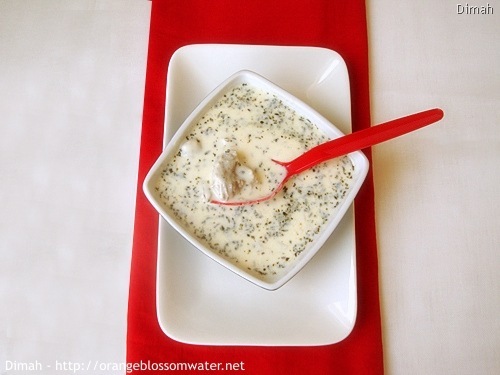 If you use “Laban Arabi” which is from sheep milk, you don’t need the cornflour (cornstarch), or any other thing, the yogurt itself is perfect for cooking. If you use other type of yogurt, you need to add cornflour (cornstarch) to prevent curdling. 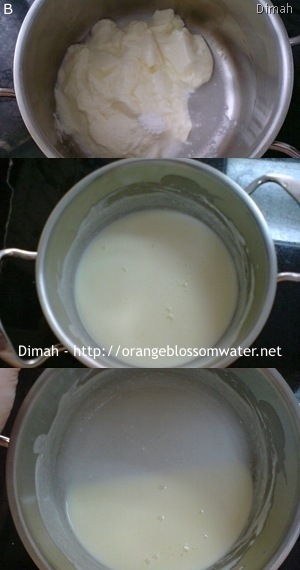 In picture “B”, I used 3/4 cup yogurt + 1 tsp cornflour (cornstarch). 1. Cut meat into cubes. 2. Put the meat in a pot and cover with water. 3. Turn on heat, and keep until boil and foam occurs on surface. 4. Once the foam is formed, you can see it very clearly, turn off heat, and take the pot and put under water so all the foam is washed and removed. 5. This is meat after removing the foam. 6. Cut the onion into quarters then cut each into slices. 7. In deep pot, heat ghee. 8. Add meat cubes and stir for 5 minutes. 9. Add onion slices and stir for 2 minutes. 10. 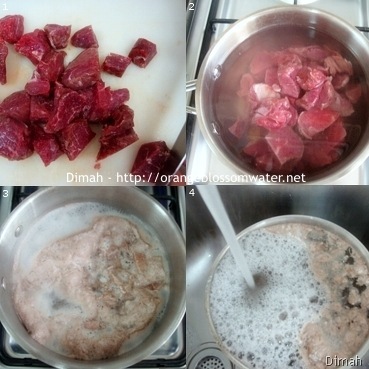 Add 3 L water to meat and onion, and add salt. 11. Cover the pot, and keep over medium heat, and check until it starts to boil vigorously. Once water is vigorously boiling, lower the heat, and cover the pot, and check on it until the meat is cooked and tender, it took 2 hours until it is well done and tender. 12. Bring another pot and add 4 cups drained yogurt (if you are not using Laban Arabi, you must add cornflour (cornstarch)) and stir using wooden spoon over low heat. (You have to start these steps of cooking yogurt when the meat is cooked, so you have to wait until the meat is finished then cook the yogurt). 13. Keep stirring until yogurt is creamy. 14. 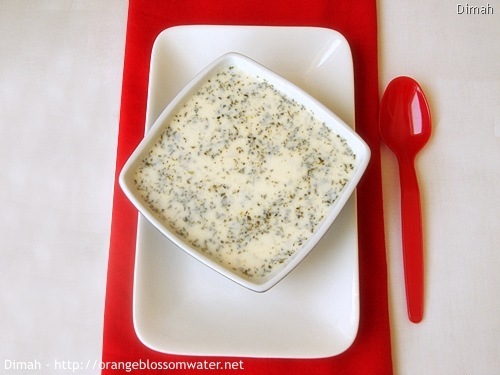 Add dried mint to yogurt. 16. Add lamb broth to the pot that contains yogurt. 17, 18. Add enough broth until you get a thin consistency, and stir. 19. Discard extra broth, and pour yogurt to the pot that contains meat, so now you have one pot contains meat, onion and yogurt. 20. Bring it to boil for 10 minutes, then you can serve it. 21. 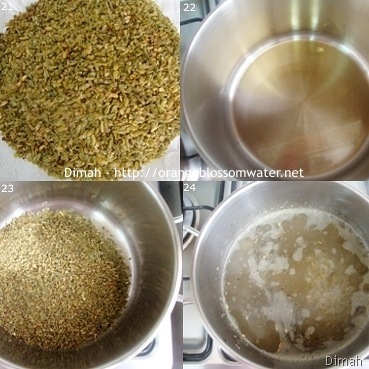 Rinse frikeh in several changes with water. 22. In a pot, melt ghee and it to high heat. 23. Add frikeh and stir for 5 minutes. 24. Add 700 ml water and add salt to frikeh and bring it to boil over high heat. 25, 26, 27. Once water is boiling vigorously, cover the pot and lower the heat and keep covered until cooked, it took about 60 – 90 minutes, taste and you will know if it is cooked or not. 29. 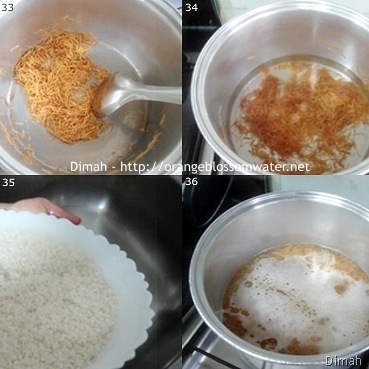 Rinse rice with water in several changes. 30. 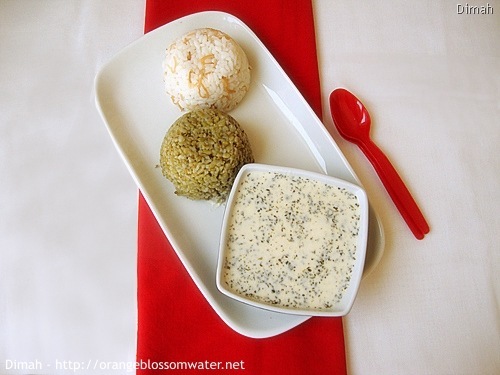 Boil water, then soak the rice in boiled water for 10 minutes, and set aside. 31. Melt ghee and bring it to high heat. 33. Add vermicelli to ghee, and stir until golden brown in color, then turn off heat and let it cool for minutes. 34. Turn on heat, then add 3 3/8 cups water and salt to the vermicelli, and let it boil. 35. 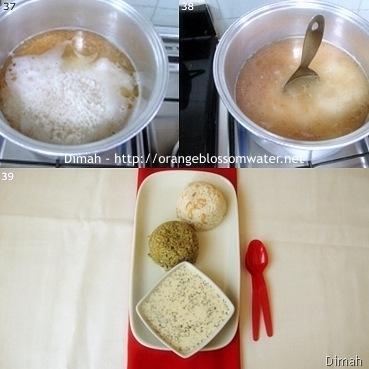 Meanwhile, drain rice, then rinse it with cold water in several changes. 36. This is the water which had been added to the vermicelli, it is boiling. 37. Once the water is boiling vigorously, add rice. 38. Check samda (know more about samda in Maqloubat Al-Bathenjan), and keep the rice for 5 minutes over high heat so it will boil vigorously, then lower heat and cover pot and keep for 15 – 20 minutes till rice is cooked, when it is completely cooked, turn off heat, stir and serve. 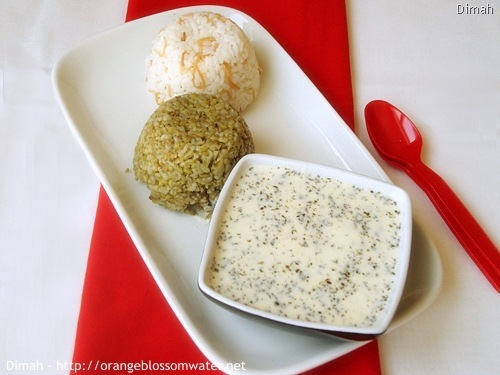 Serve Shakriyeh hot with frikeh and rice. Put the meat in a pot and cover with water. Turn on heat, and keep until boil and foam occurs on surface. Once the foam is formed, you can see it very clearly, turn off heat, and take the pot and put under water so all the foam is washed and removed. This is meat after removing the foam. Cut the onion into quarters then cut each into slices. In deep pot, heat ghee. Add meat cubes and stir for 5 minutes. 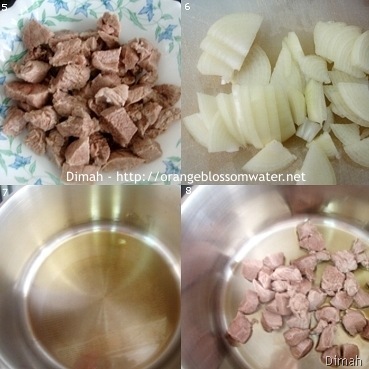 Add 3 L water to meat and onion, and add salt. Cover the pot, and keep over medium heat, and check until it starts to boil vigorously. Once water is vigorously boiling, lower the heat, and cover the pot, and check on it until the meat is cooked and tender, it took 2 hours until it is well done and tender. Bring another pot and add 4 cups drained yogurt (if you are not using Laban Arabi, you must add cornflour (cornstarch)) and stir using wooden spoon over low heat. 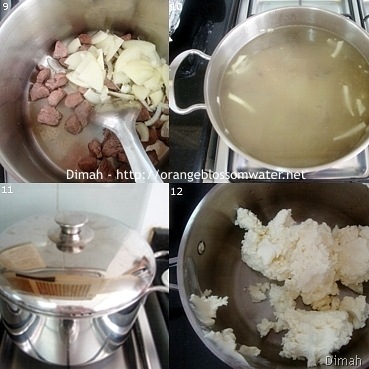 (You have to start these steps of cooking yogurt when the meat is cooked, so you have to wait until the meat is finished then cook the yogurt). Keep stirring until yogurt is creamy. 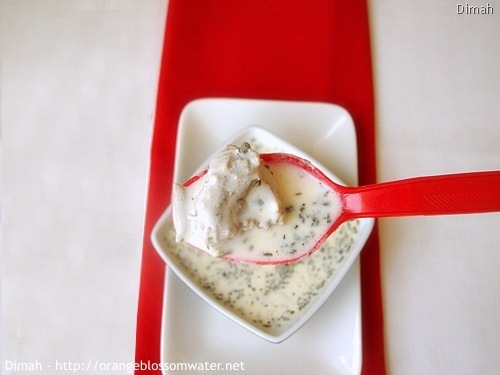 Add dried mint to yogurt. Add lamb broth to the pot that contains yogurt. Add enough broth until you get a thin consistency, and stir. Discard extra broth, and pour yogurt to the pot that contains meat, so now you have one pot contains meat, onion and yogurt. Bring it to boil for 10 minutes, then you can serve it. 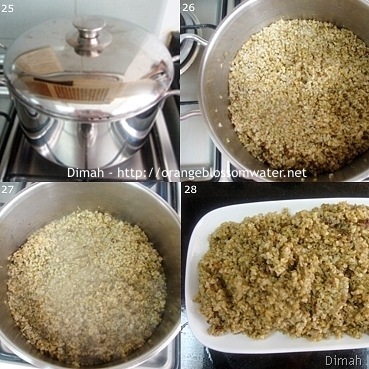 Rinse frikeh in several changes with water. In a pot, melt ghee and it to high heat. Add frikeh and stir for 5 minutes. Add 700 ml water and add salt to frikeh and bring it to boil over high heat. Once water is boiling vigorously, cover the pot and lower the heat and keep covered until cooked, it took about 60 – 90 minutes, taste and you will know if it is cooked or not. 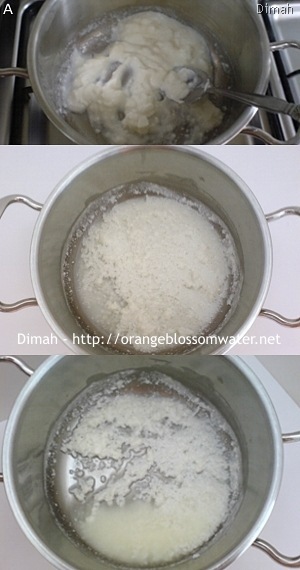 Rinse rice with water in several changes. Boil water, then soak the rice in boiled water for 10 minutes, and set aside. Melt ghee and bring it to high heat. Add vermicelli to ghee, and stir until golden brown in color, then turn off heat and let it cool for minutes. Turn on heat, then add 3 3/8 cups water and salt to the vermicelli, and let it boil. 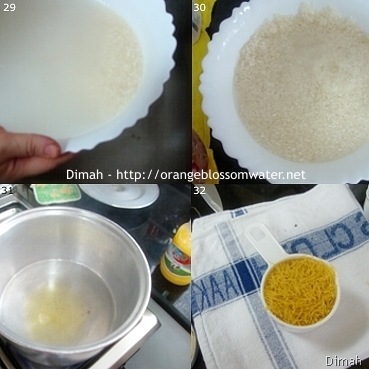 Meanwhile, drain rice, then rinse it with cold water in several changes. This is the water which had been added to the vermicelli, it is boiling. Once the water is boiling vigorously, add rice. Check samda (know more about samda in Maqloubat Al-Bathenjan), and keep the rice for 5 minutes over high heat so it will boil vigorously, then lower heat and cover pot and keep for 15 – 20 minutes till rice is cooked, when it is completely cooked, turn off heat, stir and serve. Cut meat into medium cubes or large cubes, it’s up to you. 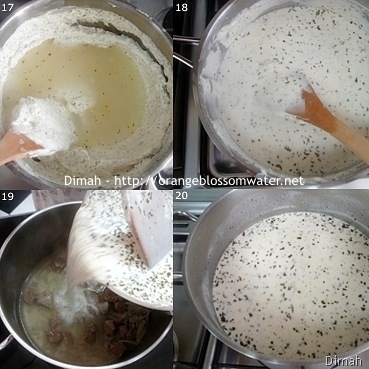 If you don’t have “Laban Arabi”, you have to add cornflour (cornstarch) to the yogurt to prevent curdling. I have a big quantity of yogurt about five kilograms, so I drain all the quantity of yogurt in a cloth to dry (the day before you plan to make Shakriye, drain the yogurt), then after all the quantity drained well to dry, I measured 4 cups drained yogurt for cooking. The frikeh which you will use may require different amount of water than mentioned in recipe, because it depends on type and brand, and the time of cooking may differ too. This entry was posted on Wednesday, August 18th, 2010 at 3:29 PM	and is filed under Syrian Cooking. You can follow any responses to this entry through the RSS 2.0 feed. You can skip to the end and leave a response. Pinging is currently not allowed. This reminds me a dish we call laban ummo here; although we don’t make it with freekeh, only rice, but what a delicious dish! Love your clear explanations on the differences in yogurt. Dimah! I love your blog so much! The recipes are so clear, it is such a good idea to have it in steps with lots of photos. The recipes remind me so much of Syria. Last time I was in Syria my auntie made shakriyeh and I loved it! I can’t wait to try it myself! My mom loves to cook Syrian dishes and actually it is Syrian cooking that I’ve picked up best from her because I love it! You have some interesting variations that I’m going to try today for a Ramadan dinner, and I can’t wait to go back home and hopefully surprise my mom with the new twists on her recipes. Thank you so much for all the recipes!